Last night at SXSW, William and the Windmill was awarded one of the festival’s top two honors, taking home Grand Jury Award for Documentary Feature. 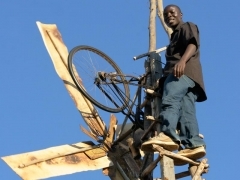 William Kamkwamba: How I harnessed the wind The film tells the story of TED Speaker William Kamkwamba, who has come to be known by the title of his memoir, The Boy Who Harnessed the Wind. At age 14, Kamkwamba built a windmill out of junk parts, adapting a design he saw in a library book in order to provide electricity for his family in rural Malawi. This incredible feat of engineering caught our attention, and he was invited to speak at TED Global 2007. His 6-minute talk, called “How I harnessed the wind,” was life-changing and catapulted him from regular teenager to international energy superstar. William and the Windmill received recognition last night at SXSW alongside Short Term 12, winner of the Grand Jury Award for Narrative Feature. Below, check out stills from William and the Windmill, courtesy of Nabors. And stay tuned to the TED Blog for a Q&A with Kamkwamba. Director Ben Nabors accepts the Grand Jury Award on Tuesday night at SXSW. A still from the film: William hard at work on his windmill. A still from the film: A windmill from afar. A still from the film: William, deep in contemplation.